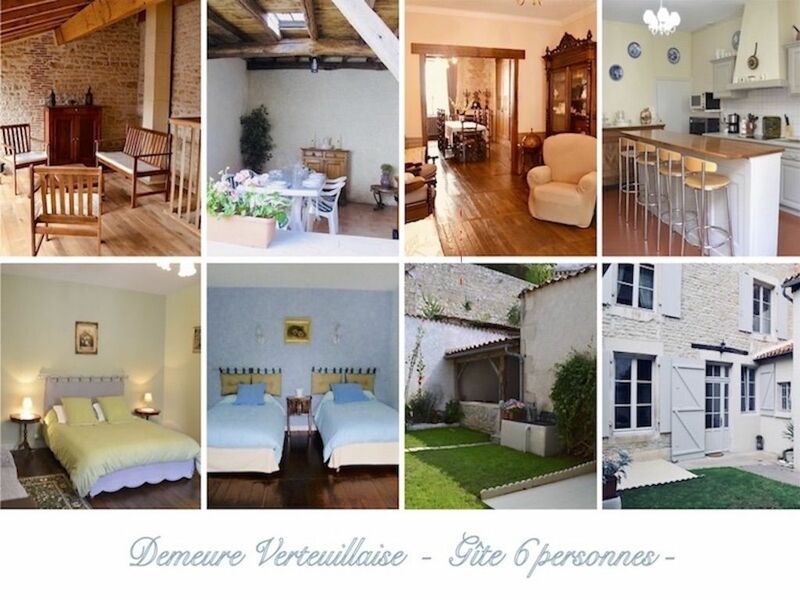 Charming Residence in the village of VERTEUIL and at the foot of his castle. There are 4 pleasant and comfortable rooms, 2 overlooking the garden 1 & view of the castle, and 2 others on the village square. The rooms consist of: 1st bedroom bed 160cms wide, 2nd bedroom 2 beds (twin) 120cms wide each. 3rd bedroom bed for 2 people and the 3rd bed 12O cm wide. There are 2 shower rooms with comfortable and spacious shower cabin. On the ground floor, a large living room (sofa and 4 armchairs) with big screen TV and a living-dining room which together made 50 m2, functional kitchen, nice and bright scrolling to the garden, well equipped ( dishwasher, oven, induction, microwave oven plate, Refrigerator, Coffee maker, electric teapot ..), adjoining storeroom with washing machine, iron and ironing board. Small garden without opposite preserving its intimacy with view on the Castle, a covered terrace of 25 m2 with living room of garden and barbecue for lunch or dinner in peace. A Mezzanine of 20 m2 in a former dryer with summer lounge to enjoy the sunny afternoons of Charente. Our two recent and comfortable shower rooms include two spacious shower cubicles of 1.20mx 0.8m. hair dryers. Option of towels 5 euros per person including 1 shower sheet, 1 towel. A 500 EUROS DEPOSIT WILL BE REQUESTED ON THE DAY OF YOUR ARRIVAL BUT NOT BILLED AND WILL BE RETURNED AT THE END OF THE STAY AFTER STATEMENT OF THE PLACE. Merci pour l'accueil des propriétaires très sympathiques, merci également pour le cadeau de bienvenu. Je recommande cette location très bien située dans le très beau village de Verteuil (commerçants sympathiques et accueillants). Le plus de cette location : la cour fermée avec ses espaces repos, son espace repas (couvert et meublé avec goût). Nous vous remercions de vos appréciations, nous avons été ravis de vous recevoir et touchés de votre gentillesse, nous serons heureux de vous revoir. Mention spéciale pour la petite brioche à notre arrivée et le ménage absolument parfait. Une caution de 500 euros vous sera demandée sur place en chèque ou espèces pour les vacanciers étrangers mais non encaissée et restituée à la fin du séjour après état des lieux.